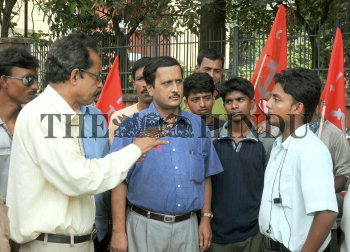 Caption : Kolkata: The CITU supporters and leaders are trying to convince the IT Professional (right) for not joining the job on the bandh day at Salt Lake Sector V in Kolkata on Tuesday. It was a dream of the West Bengal Chief Minister Buddhadeb Bhattacharjee to give relief the IT Sector from all bandh activities. But in today?s bandh, CITU has stepped in to the Sector V in Salt Lake and successfully shut down all the companies. The 12-hour nation-wide bandh called by 13 non-NDA and non-UPA parties to protest against price rise hit normal life and affected air and rail services in Left-ruled states of West Bengal. The shutters in commercial areas were down. Hundreds of passengers were stranded at railway stations and airports for want of transport. Photo: Arunangsu Roy Chowdhury April 27, 2010.